The Notch pathway is one of the most important and well conserved signalling pathways that controls many different cell decisions and is associated with a number of diseases, including cancers. However, the consequences of activating Notch differ according to the cellular contexts. At one extreme Notch promotes proliferation and has been linked to tumor promotion, at the other hand it causes cell death and is considered as a tumour suppressor. In order to fully understand this apparent contradiction it is of vital importance to determine which factors are responsible for the modulation of Notch signalling pathway. 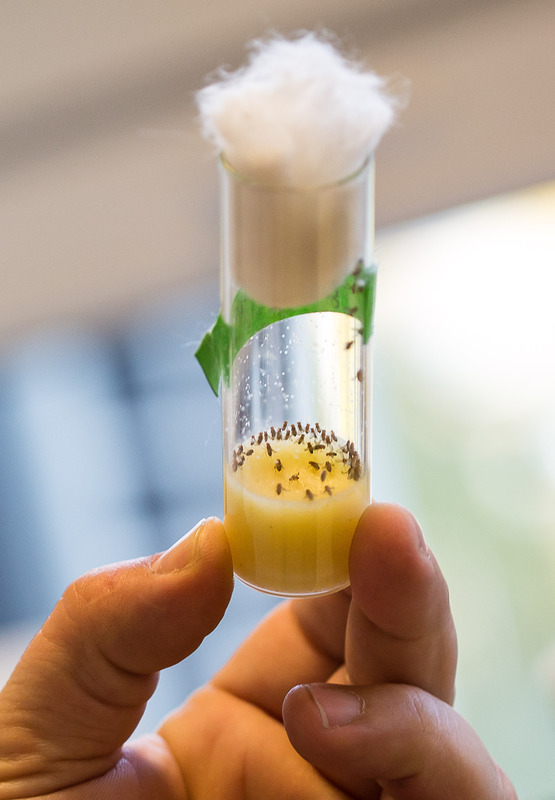 We are using Drosophila as model organism to investigate how cellular metabolism influences the outcome of signalling pathways, with an emphasis on Notch signalling. In our laboratory we investigate the nutritional/energetic state of a cell as potential regulator of Notch activity. Recent research suggests that several small metabolites, like 2-oxoglutarate, acetyl coenzyme Q or ATP are used as cofactors or substrates for a whole range of protein metabolic sensors that connect cellular metabolism to the regulation of signalling, transcription or other crucial processes. We are particularly interested in the NAD+ and NADH levels as modulators of cell signalling. Using cultured cells as well as Drosophila model of Notch dependent cancer-like overgrowth we would like to determine how Notch signalling is influenced by changes in the cellular metabolic profile and what the molecular determinants are behind this regulation. We also investigate how some of the metabolic genes are under the transcriptional control by the Notch pathway, thus creating regulatory loops. As a consequence we anticipate this will help to explain the differing responses to Notch activation and provide additional insight into Notch signalling under physiological conditions as well as in cancer. Pérez-Gómez R, Slováková J, Rives-Quinto N, Krejci A, Carmena A.: A Serrate-Notch-Canoe complex mediates essential interactions between glia and neuroepithelial cells during Drosophila optic lobe development. J Cell Sci. 2013 Nov 1;126(Pt 21):4873-84. Terriente-Felix A, Li J, Collins S, Mulligan A, Reekie I, Bernard F, Krejci A, Bray SJ: Notch co-operates with Lozenge/Runx to lock hemocytes into a differentiation programme. Development, 140(4):926-37, 2013. Housden BE, Fu AQ, Krejci A, Bernard F, Fischer B, Tavare S, Russell S, Bray SJ: Transcriptional Dynamics Elicited by a Short Pulse of Notch Activation Involves Feed-Forward Regulation by E(spl)/Hes Genes. Plos Genetics, 9(1):e1003162, 2013. Djiane A, Krejci A, Bernard F, Fexova S, Millen K, Bray SJ. : Dissecting the mechanisms of Notch induced hyperplasia. EMBO Journal 32, 60 - 71, 2013.